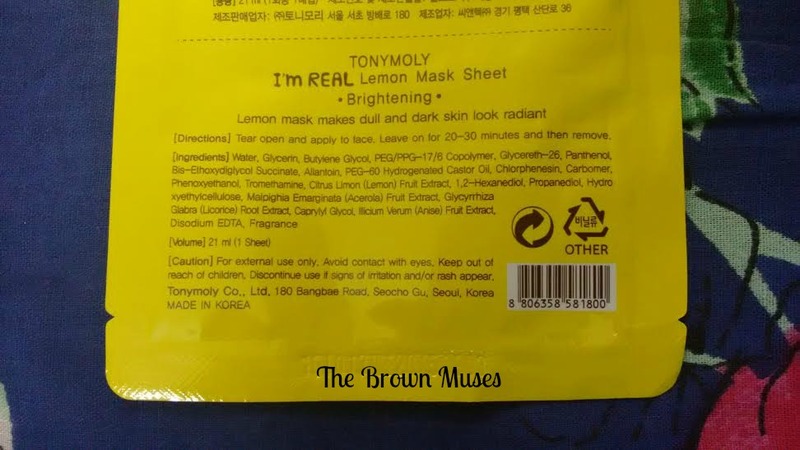 I purchased two Tony Moly Sheet Masks from Zanna Accessories for INR 150 each. You can purchase them here. 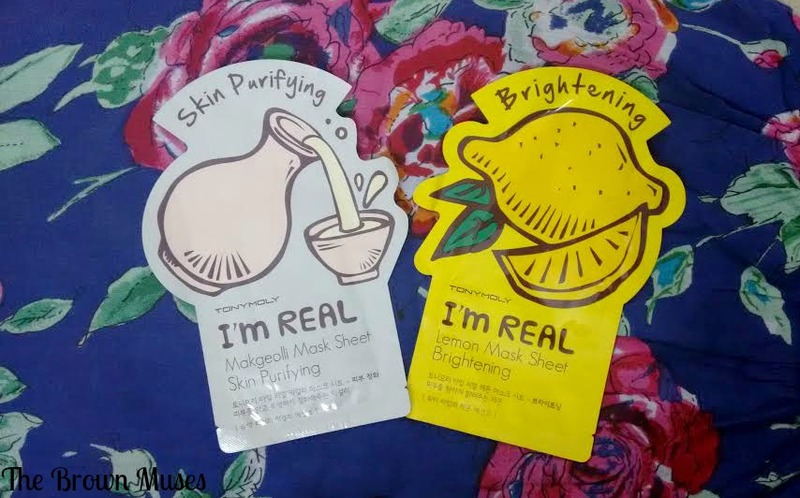 I purchased I'm Real Makgeolli Mask Sheet Skin Purifying & Lemon Mask Sheet Brightening. 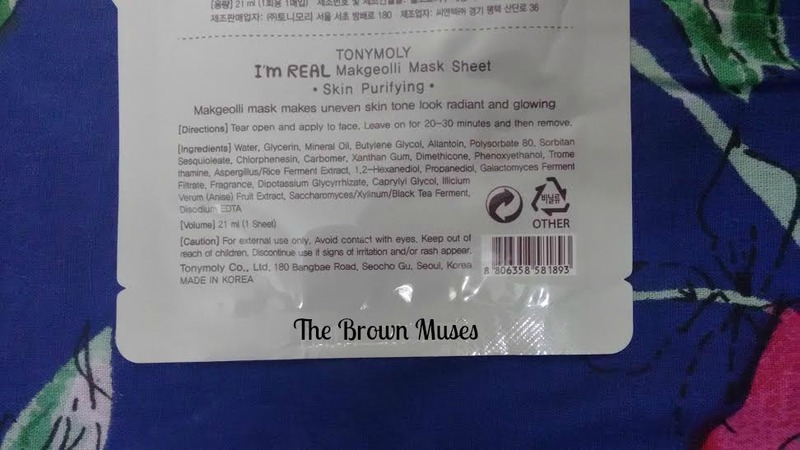 This one of the mask in their I'm Real Sheet mask line. It comes in a plastic packaging which is secure and easy to carry. I had no idea what Makgeolli is so I searched it using the internet and it is a Korean alcoholic beverage made from rice/wheat. The mask smelled really really nice like some high end skincare product but a bit on the stronger side, it may bother sensitive noses. The claim on the back of the packaging says this mask is supposed to make uneven skin tone look radiant and glowing. The essence of this mask is white in colour. When I removed the mask from the packaging it was literally drenched in essence and some even spilled. I immediately put on the sheet mask on my face and kept it on for 15-20 minutes. I had first washed my face with a mild cleanser before putting on the mask. After removing the mask, I squeezed out the remaining essence from the packaging and massaged it gently on to my skin. I didn't put anything thereafter, my skin did feel sticky for sometime which wasn't too bothersome. The mask hydrated my skin really well, however I only noticed a glow after 20-30 minutes. My skin looked fresh, brightened and the smell of essence lingered on! The effect lasted until next day. Putting on this mask becomes a messy affair ONLY if the essence spills otherwise the mask is very easy to use. Makes the skin look fresh and healthy. Smells luxurious like a high end skincare product. Easy to use and delivers on claim. The skin feels sticky after removing the mask due to the essence. Availability - Not a con for me as I do not mind buying it online. Along with the Makgeolli I purchased the lemon one too which I used a week after the Makegeolli one. The back of the packaging claims to make dull and dark skin radiant. This one had a very mild smell of lemons which fades away within minutes. The sheet mask was drenched in essence when I tore open the packaging. The essence was dripping and I immediately put on the mask after removing it from the packaging. I had washed my with a mild cleanser prior putting on the mask. I kept the mask on for 20-25 minutes and after removing it I squeezed the essence from the packaging and gently massaged it all over my face. The mask proved to be a dud though. It did really nothing for my skin. I didn't notice any glow or radiance but only a slight hydration. The essence felt super duper sticky on my skin, the stickiness didn't go away like it did with the makgeolli one. This product disappointed me. Didn't notice any glow or radiance on my skin. Didn't deliver on claims. Will I recommend: I would recommend the Makgeolli sheet mask! If you have used sheet masks too then feel free to share your experience with us! We love to hear from our readers.